During the past few decades, the 100-foot (30-meter) market has seen function driving form. 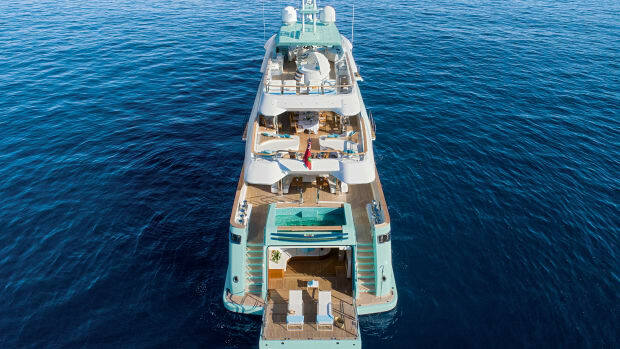 That is starting to change, thanks to a trickle-down effect from the ever-increasing superyacht arena, where designers are creating more voluminous interiors and more expansive decks. Owners want those qualities in smaller packages, making the 100-foot size range a crown jewel among semi- and full-custom builders alike. 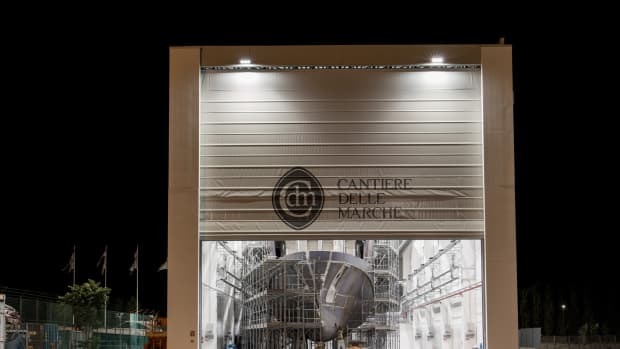 If the goal is to pack as much volume as possible into a 100-foot hull, then the Italian shipyard Cantiere delle Marche has produced one of the best achievements in design I’ve seen to date. 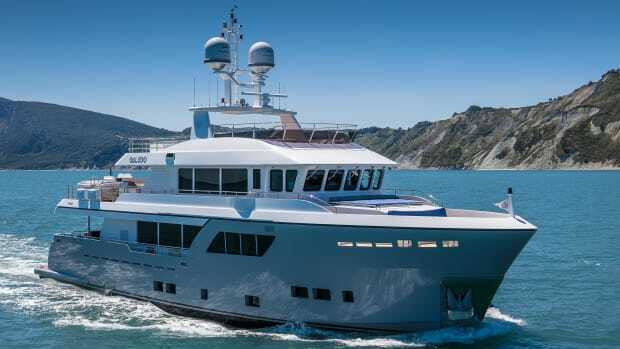 The first offering in CdM’s Nauta Air series of explorer yachts, 109-foot (33.4-meter) Narvalo is a three-deck, long-range displacement vessel built in steel and aluminum. 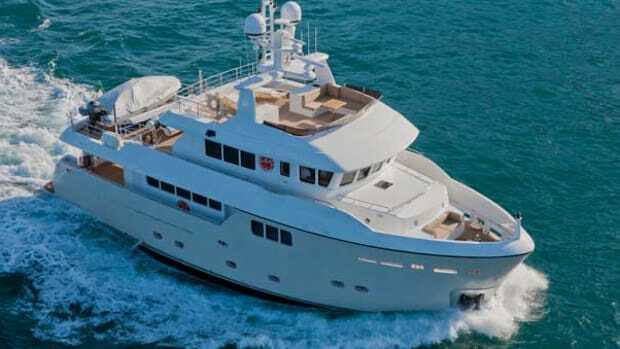 Commercially rated twin 715-hp Caterpillar C18s give her a top speed of 13.5 knots, and at 9 knots, her range is north of 5,000 nautical miles. 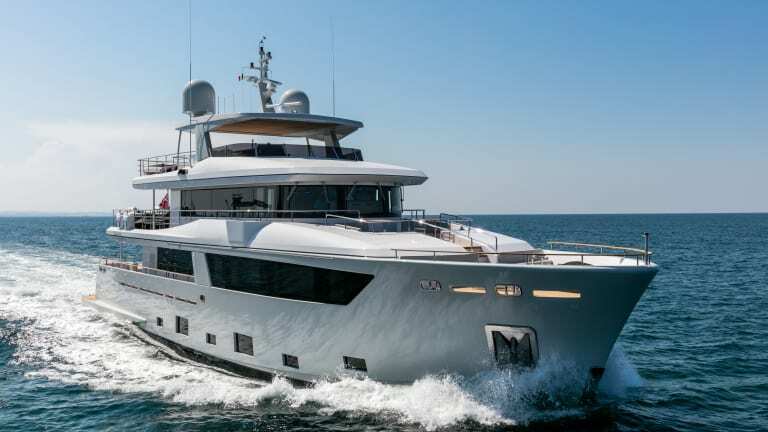 CdM seems to have used every square inch of her 24-foot-7-inch (7.5-meter) beam in achieving her 296 gross tonnage, as executed by the Milan-based Nauta Yachts, the same firm that designed the world’s largest yacht, 591-foot (180-meter) Azzam. The owner’s brief specified a beach club and living spaces conducive to enjoying life with friends. Unmistakable from the dock, the 108’s wide-open transom is one of her most striking features, and it fulfills both requirements beautifully. The clean, open layout represents a fresh take on exterior design. Wide steps leading to the swim platform, raise in the center to reveal the beach club and toy garage beneath. Narrow stairways remain on each side, maintaining access to the swim platform. 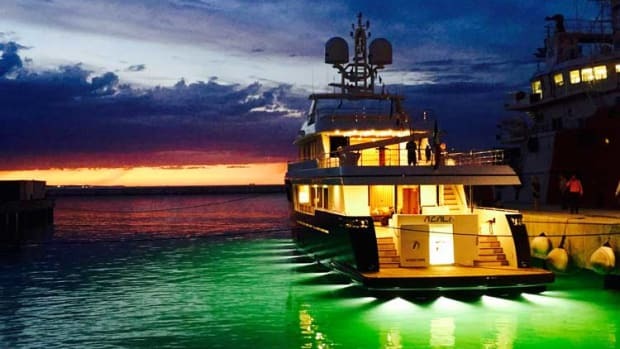 A number of other superyacht traits are in other areas aboard. Foremost is her on-deck master suite. 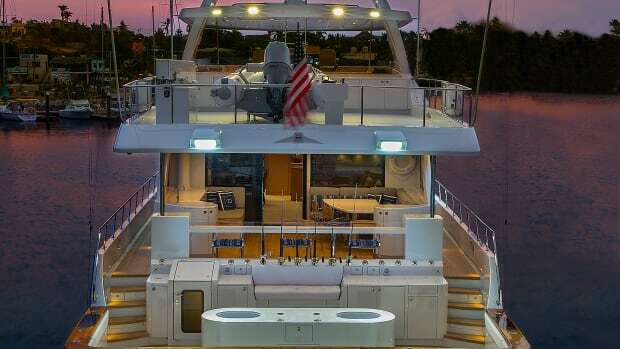 Full-beam and far forward on the main deck, it includes an office, a his-and-her ensuite bathroom, a wardrobe, electrically operated lighting and shades, and an iPad-controlled entertainment system. 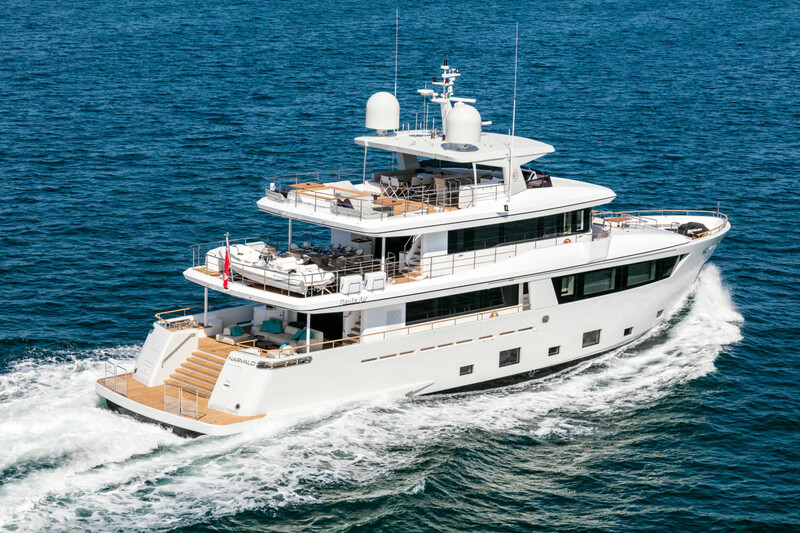 A lobby on the lower deck gives way to four staterooms, bringing the total guest complement to 10 (or 12 if you use the Pullmans). Each stateroom has a queen-size bed, ensuite bathroom and entertainment system. Seven crew are accommodated in quarters forward on the lower deck, with stowage in a sub-lower deck dedicated to provisions that should allow Narvalo to remain at sea for weeks on end. Paola Lenti and Minotti furnishings adorn the living areas, while leather, glass and stainless steel accents balance the light oak wood throughout. 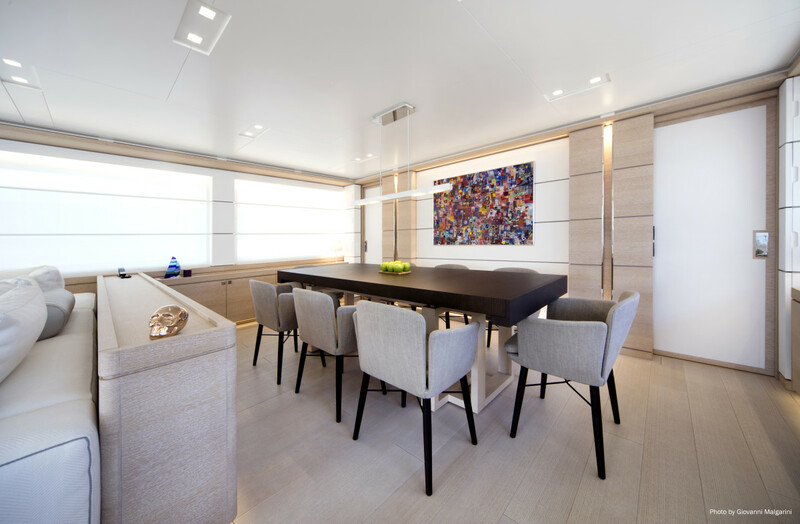 Just forward of the main-deck salon is a formal dining area that seats eight, with a charter-capable galley to port. 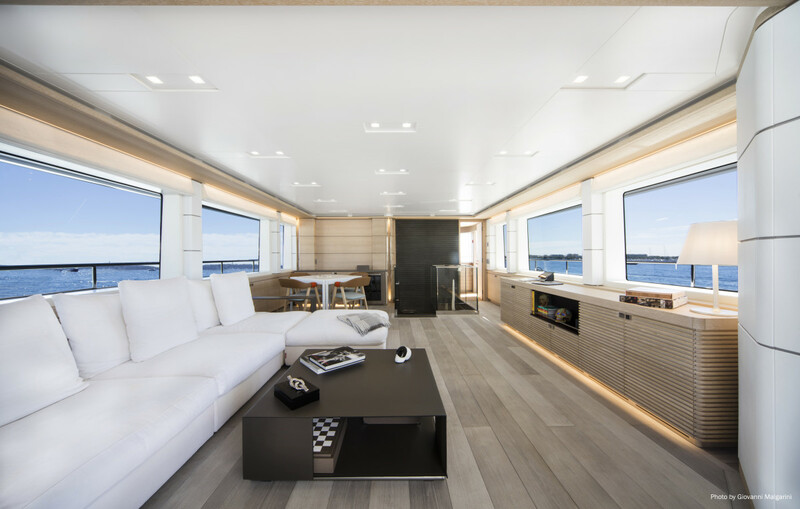 Rectilinear windows on all three decks allow a ton of natural light into Narvalo’s interior. The formal dining area comfortably seats eight. Barely a shade smaller than the main salon, the bright sky lounge is a prime relaxation or entertainment space. 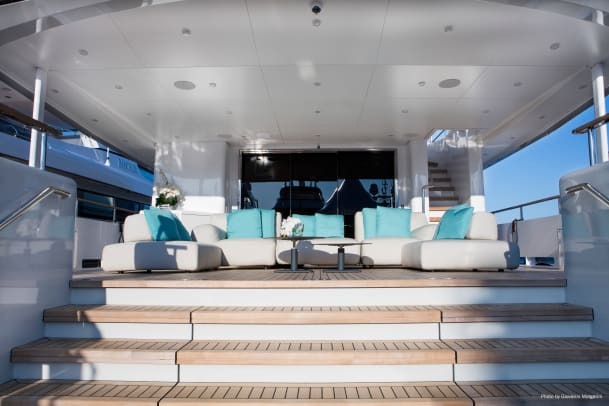 Abaft the wheelhouse on the upper deck, a sky lounge nearly as voluminous as the salon is a prime entertaining space, with an alfresco dining area aft. The wide deck space holds up to an 18-foot tender and/or PWC, deployed via hydraulic crane. 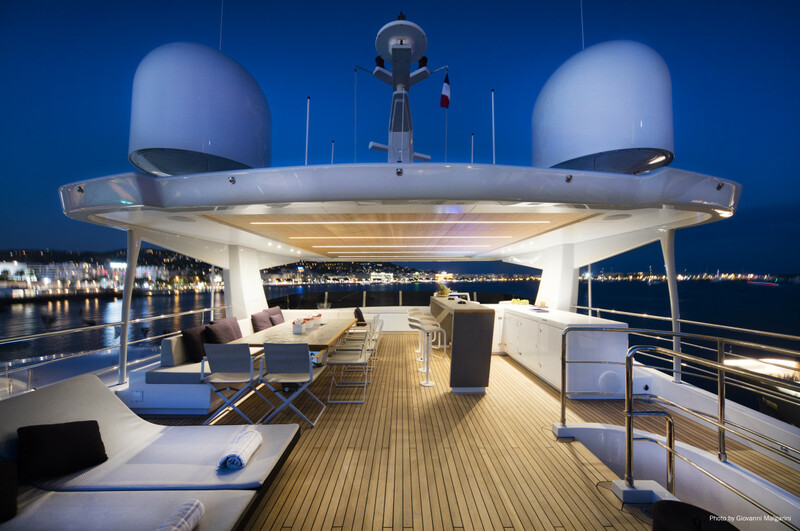 To my taste, the best spot on the yacht is the sundeck. Spanning 753 square feet (70 square meters), this outdoor oasis is a stunning observatory over the sea. Aft is a low-profile spa tub designed with infinity pool aesthetics. 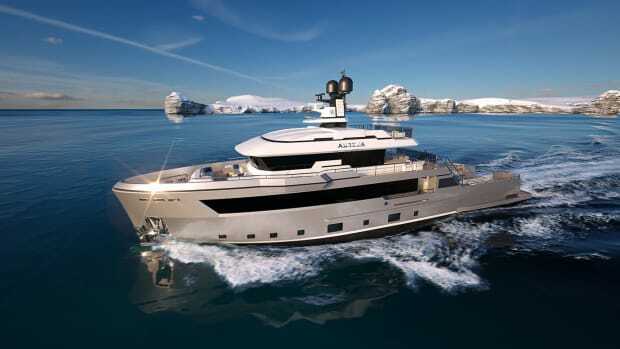 Forward is a day helm, another dining table and sunpads. Amidships is a striking bar crafted with a modern, minimalist design. Modern design elements are found throughout the boat. 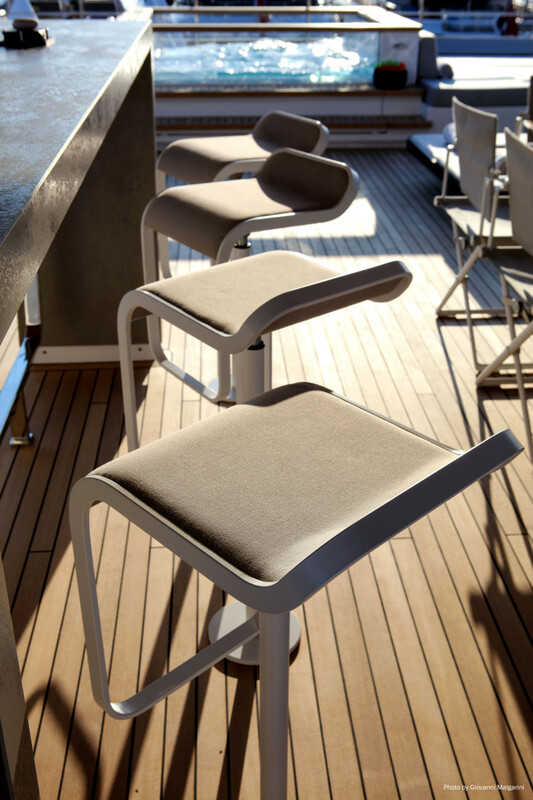 There’s plenty to do on the well-appointed sundeck. 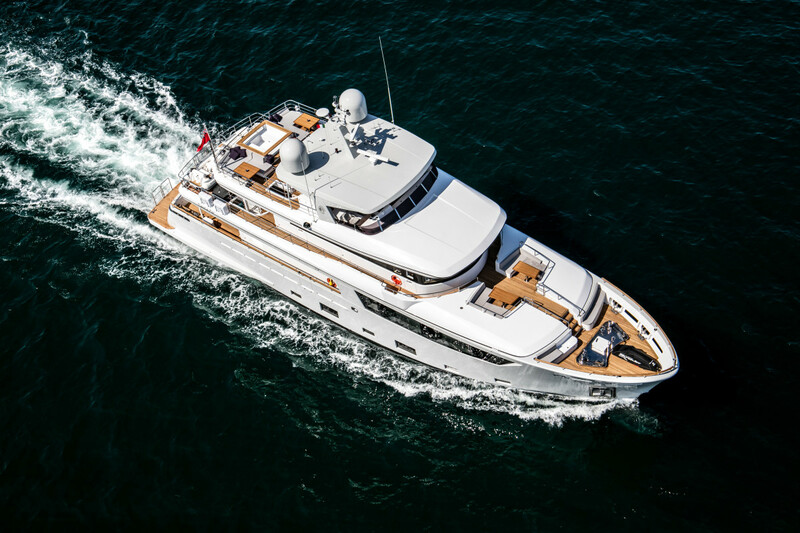 Built for long-range stints at sea, Narvalo also has a Dynamic Positioning System and a minimal draft of 7.5 feet (2.3 meters). At the time of this writing, she was exploring the Caribbean. 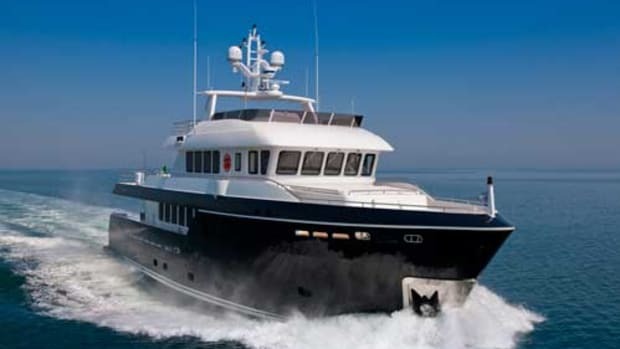 Her commercially rated twin 715-hp Caterpillar C18s give her a top speed of 13.5 knots, and at 9 knots, her range is north of 5,000 nautical miles. 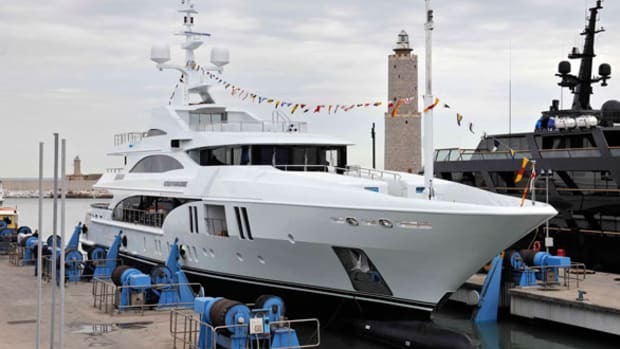 Personally, I’d go for the latter, which means all the longer to enjoy Narvalo’s superyacht-style amenities. I’ll take an Aperol spritz, please, and if anyone needs me, I’ll be on the sundeck.